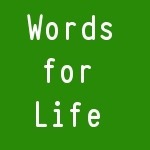 Words for Life is by Rev Mark Durie of Oaktree Anglican. His talk title is “The promise, purpose and power of Easter”. Talk time is 21 minutes.